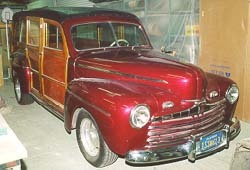 Bruce Cohn's '46 Ford in shop for refinishing. 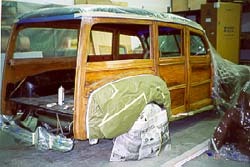 All wood needs to be sanded and repairs made where necessary. 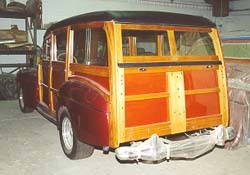 This unique '46 Ford was rewooded in the Phillipines with Mahogany wood used throughout. 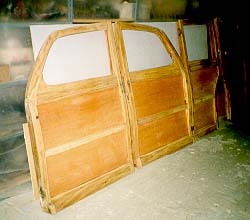 Front and rear doors stripped with new mahogany panels installed. 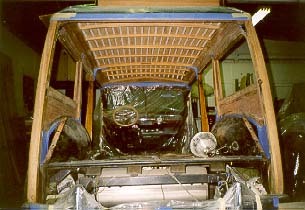 Interior sanded to bare wood, new quarter panel mahogany installed, ready for varnish. 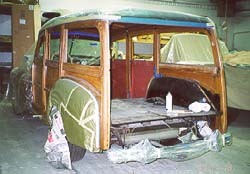 Final varnish coat is done and body is reassembled. New door rubber seals are installed. All new blind nuts installed and hardware is replaced. Car is finished and ready to hit the road!